Top & bottom picatinny rails make the BT4 Combat tactical paintball gun highly upgradeable; accurate, reliable & easy to shoot. Find it for sale here at a cheap, discount price! 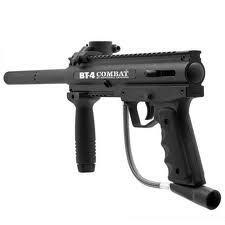 If you're looking for a great all around basic paintball marker, the BT-4 Combat is one of the best. This gun is a great beginner's gun because it's so easy to use and maintain. However many advanced players also love this gun because it makes a terrific base for customization. The BT-4 Combat is super sturdy and can withstand extreme abuse for a long time. It has a durable stainless steel bottom line and the whole gun is protected by impact resistant baked on coating. The BT-4 is lightweight, well balanced and easy to shoot accurately. The BT-4 also features a slide-away feedport that makes cleaning and maintenance super easy and quick. It also has an external velocity adjuster that offers easy access and is tournament legal. This gun is compatible with either CO2 or high pressure air. One of the best things about the BT-4 is that it's so upgradable. The grip frame is removable for easy installation of custom upgrades; the vertical grip is also adjustable. This paintball gun will easily accept expansion chambers and has both vertical and horizontal air tank adaptors. Best of all, the BT Combat features two picatinny rails on top and bottom of the gun for tons of customization options with accessories; add a carry handle, scopes, sights, lasers, lights, the choices are nearly endless! The BT-4 Combat has compatible barrel threads the Tippmann A5 or X7. The BT Combat body style/receiver is compatible with Tippmann 98 parts; buttstocks, magazines and grips will fit any that would also fit on the Tippmann 98 Custom. This allows for an amazing amount of accessories available for this gun. 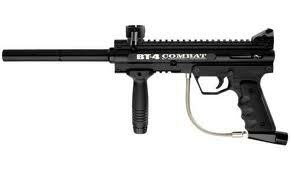 Finally, the BT-4 Combat paintball marker comes with a 1 year full parts and labor warranty through the manufacturer. Buy the BT-4 Combat tactical paintball gun from Choicepaintballguns.com and you will get the best price and service you will find on the internet!